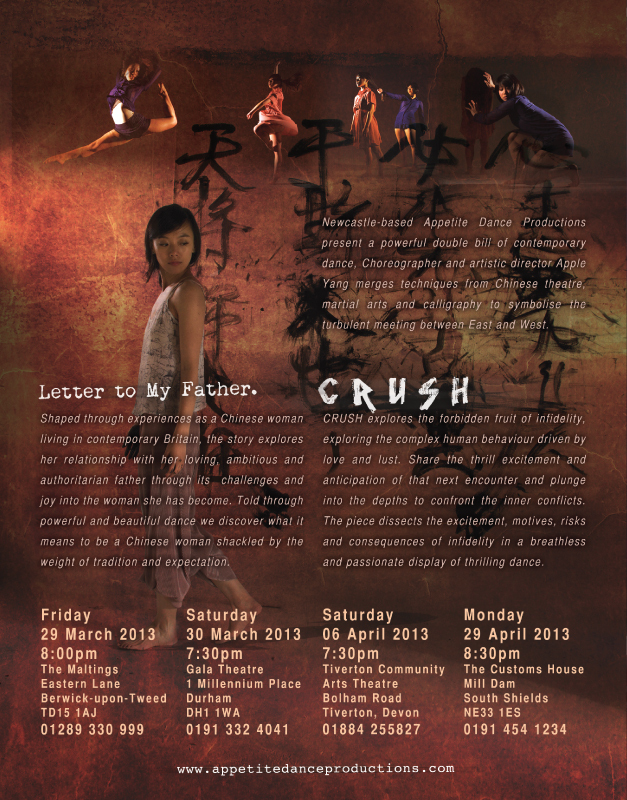 CRUSH explores the forbidden fruit of infidelity, exploring the complex human behaviour driven by love and lust. Share the thrill excitement and anticipation of that next encounter and plunge into the depths to confront the inner conflicts. 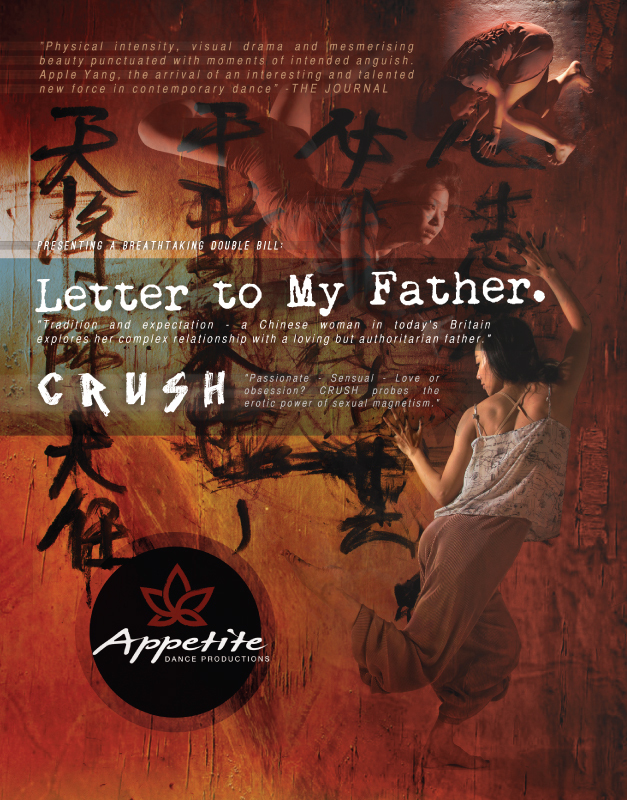 The piece dissects the excitement, motives, risks and consequences of infidelity in a breathless and passionate display of thrilling dance. Ana Dias was born in Lisbon (Portugal) and studied ballet from an early age in Porto. She concluded a BA (Hons) in Dance Theatre at Trinity Laban. Since graduating she has worked with Mafalda Deville, James Williams (Emerge 2012: a platform for upcoming choreographers created by C-12 Dance Theatre); and Tara D’Arquian (Resolution! 2013). Ana joined Appetite Dance Productions (ADP) in 2013. Darja Reznikova was born in the Ukraine and studied at the Akademie des Tanzes in Mannheim and the Academy of Performing Arts in San Diego, CA/USA. In 2009 Darja graduated from Bird College in Dance and Theatre Performance She worked with choreographers such as Anh Ngoc Nguyen Random Dance Company, Nikki O’Hara (Motionhouse), Fleur Darkin, Marc Bruce, Charles Linehan, Mandy Montanez, Tessandra Chavez and Brooke Milliner, Sidi Larbi Cherkaoui and Joe Wright, Darja joined ADP in 2013. Lu Wit Chin is Chinese Malaysian and graduated in Contemporary Dance from The Hong Kong Academy for Performing Arts where he studied under full-scholarship from the Hong Kong Government. In 2010, His solo work <L’etranger> was invited by Korea government to perform in Busan International Arts Market. Lu was the former dancer for JSDance Theatre, TDS ballet solo competition and the most recent dancer in Canon 650D TVC. Lu joined ADP in 2013. Marc Stevenson is a versatile dance performer influenced by hip-hop, capoeira and west-african dances. He trained for nine years in Compagnie Grenade in Aix-en-Provence (France) both as a youth dancer and a professional. Based in London since late 2010, he worked with choreographers and companies including Dance Theatre of Ireland, Jose Agudo, Hagit Yakira, Shaun Parker & C-12 Dance Theatre, and Pair Dance. Marc joined ADP in 2013. Stephen Moynihan is from Cork, Ireland where he began dancing at Colaiste Stiofain Naofa. After graduating from London Contemporary Dance School, he has worked for companies around the UK and abroad including Retina Dance Company, Joe Moran, Tom Dale Company, Zoi Dimitriou, T.R.A.S.H. as well as receiving a DanceWeb Scholarship Program as part of Impulstanz in Vienna. Most recently he has worked with Akram Khan for the London 2012 Olympic Opening Ceremony. Stephen joined ADP in 2013. Tomomi Kosano studied BA in dance at Roehampton University, and joined Mapdance in University of Chichester, completing an MA in Performance Dance. Since then Tomomi performed in Crossroads (by Luca Silvestrini), the Olympic closing ceremony, Silversmith Dance Theatre, Dance film: Net of Life (by Lucy Ridley), Yamato-Nadeshiko (by Ryota Kodera),Does Ｍy… Do I? (by Leda Franklin) and Pieces of Mosaic (by Elena Jacinta). Tomomi joined ADP since 2012. Jeremy Bradfield. Jeremy is a composer, sound designer and multi-instrumental performer who completed a Masters in Music at Newcastle University in 2009. Theatre includes Attempts On Her Life (Northumbria University), Playing The Building (Sage Gateshead 2010); La Chanson du Retour (Théâtre Sans Frontières/ Sage Gateshead 2011); Where Those That Stood Before (FallenFromGrace, 2012), The Prize (Live Theatre/ Murmur 2012), Blue Boy (New Writing North/ Northern Stage 2012) and Jack & The Beanstalk (Dance City 2012). In October 2012, Jeremy composed a score for Guy Mankowski’s novel Letters From Yelena (choreographed by Dora Frankel).